Monday morning is always the big FEMC weekly safety meeting in which we do our daily stretching and then focus on a safety topic. While we were stretching this morning, the station manager, Andy, looke over at me and said, “I saw the wierdest thing on the I drive last night (this is our local network). I was looking for pictures for the sitrep (our weekly reports to NSF) and saw this folder called ‘Lynette’s Birthday’ - it had all these pictures of you - I guess?” I just stared at him. He said “Was it your birthday recently?” I said, “Yes, Today.” and started laughing a bit. He just stared at me. Katie, one of our friends looked at him and said, “Don’t you just hate it when you ruin a surprise?” The news that it was my birthday ran through the group quickly - I still didn’t really know what Andy had seen & I promised not to check it out - curiosity had definitely grabbed me by now, though. I went by Jason’s office and told him about the morning conversation during the FEMC stretching. I asked if I was allowed to check out the I drive. He said, “No” – but then added with a grin – you’ll see it soon enough. With that, I headed to the galley for some morning hot chocolate to start some office work that needed to get done. One of my friends waved from the galley and I decided to walk over and say good morning. 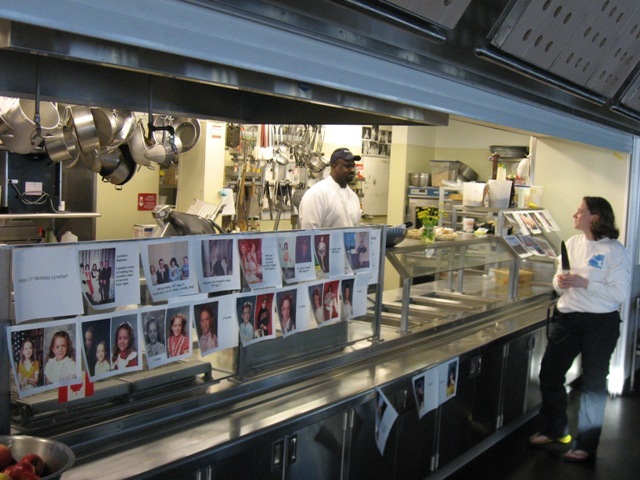 Enroute, some pictures caught the corner of my eye as I passed the food serving line. 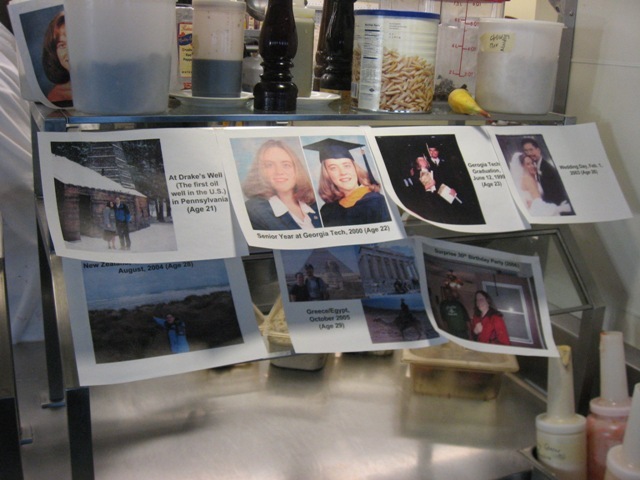 I looked over and saw the section was covered with pics of me from college to my awesome 30th surprise birthday party. When I soaked in the full span, there were actually pics of me from childhood all the way through this year. 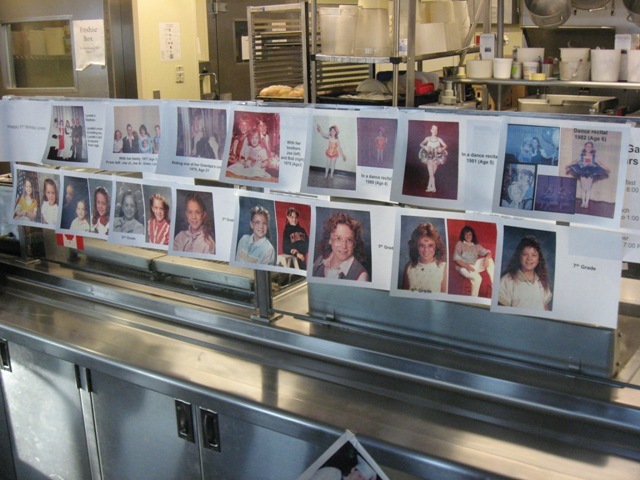 It really caught me off guard to see 8.5×11 pics of me growing up through the years. I was laughing so hard I started crying a bit. My mom was more than helpful in making my 31st birthday a memorable one. She has (apparently) been scanning pics of me growing up and sending them to Jason electronically over the last few weeks. Between the pics she sent and what Jason already had on our laptop from recent years, he had a collection of pics of me that ranged from 1yr old to 31yrs old. There were the fall and spring pics from various years in school, dance pictures, sports pictures with my brothers, family pictures, our wedding, and a bunch of random pics. Shortly after the revelation, Jason came around the corner into the galley (he apparently gone looking for me after I left his office and when I wasn’t in mine, he checked the galley). We checked it out together, I pointed out that a few of them weren’t in chronological order and we laughed about some of the really bad ones before he walked me to my office. 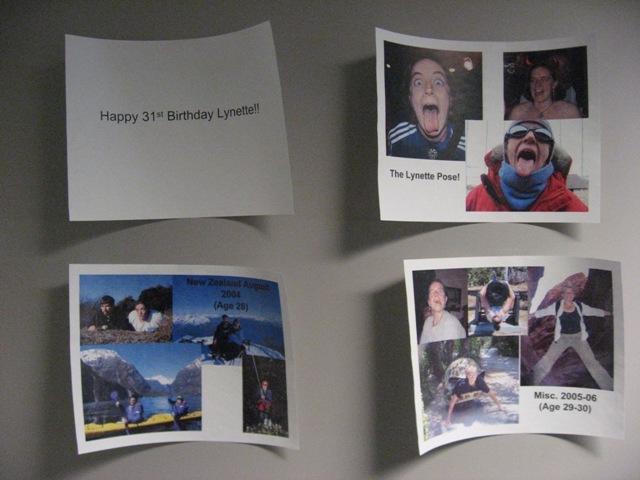 That was surprise #2 – my office was decorated with streamers and even more pics (different ones). He took some pics and left me to work. Shortly after I had gotten into a grove at my desk, Jason called my desk and told me to check out the weather for the day – “It’s crazy!” I pulled up the scroll. The scroll is our format for internal announcements and activities. We have tv’s in the galley and it can be accessed from any computer. There are a couple of slides (flight schedules in the summer, activities, and weather). The weather report always cycles through some pictures each day. The weather today would be cycling through pics of me growing up. Jason picked his favorite 40 (out of the 70-something that he and my mom put into the collection) to cycle through the scroll. Later in the morning, I was talking with a friend in the computer lab just outside my cubicle when a reference was made to all the pictures. As he said something, he glanced up at the wall near the lab entrance. I followed his gaze and realized there was a third conglomeration of pictures. These were collages that Jason had put together of recent years. After work, Jason and I hit the gym and then the showers before catching a late dinner. 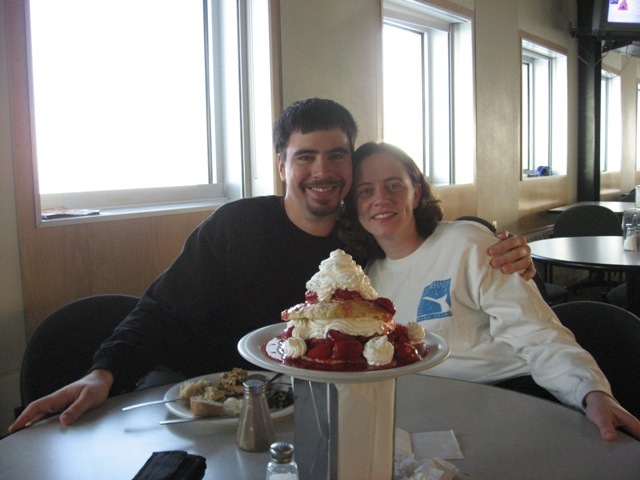 He had worked with the galley staff to have them make a strawberry shortcake to celebrate my birthday. From there, we went to the astronomy class before heading to bed. I have just 3 short months to stake my retaliation – I mean, my loving response to show him my appreciation when his birthday rolls around. Anyone have any ideas? that was neat,,, the energy you people have,,, awesome.l. I am so glad to help out! A belated “Happy Birthday” The pictures and story of your birthday were great. It took lots of time to do that I know as I e-mailed over 100 pictures of our family to Amy who put them on a DVD. Some of the pictures were not clear but it is the memories that counts and she put it to music. I enjoy your stories and think with what you all write you can have it published in a book of your adventures. Talk to you later. Thanks! It was a lot of fun - the embarrassment was only minor. I did definitely feel loved for my birthday as those 2 put a lot of work into it. We’re glad that people are enjoying reading. As winter doesn’t have as many stories, we are excited to start detailing the station and our surroundings a bit more.